I Love You More Than Carrots: The Cleanest, Friendliest Amusement Park There Ever Was. The Cleanest, Friendliest Amusement Park There Ever Was. Last weekend and on a whim, friends of ours asked us if we'd be willing to make the hour forty-five minute trek up to Lancaster, Pennsylvania to spend the day with them at Dutch Wonderland, a 48-acre amusement park that caters primarily to families with small children. Having never had much experience with carnival-type rides, I was a little weary bringing the boys, 2 and 4, to the park. I was afraid that they'd hate the rides and our adventure would be a bust. Thankfully, that wasn't nearly the case. I mustered up every ounce of adventure in my bones, packed the car for what felt like a week away rather than just one day and loaded everyone, including the baby and my husband into the car. I had seen commercials for the park on TV and will admit it did look pretty awesome. The kids were super excited to "go out on a ba-venture" and I wasn't sure at this point who was looking more forward to our day away. With over 30 fun-filled rides, Duke's Lagoon water play area and live entertainment, deep down I knew we would all have a really great time. Being that it was a Sunday, and one soon after schools had let out, I braced ourselves for some traffic and long lines once we arrived at the park. We arrived promptly at 10:30am, only thirty minutes after the park had opened. The parking lot was FULLER than FULL but thankfully parking was free. Once we parked, sprayed ourselves down with sunscreen and made sure to pack a few extra bottles of water for the long, hot day ahead, we donned our swimsuits and headed straight for Duke's Lagoon. Immediately upon crossing the threshold of the park, I swear I saw each of my boys begin skipping merrily together, hand in hand. The park and all of its amusement glory seemed to have that effect on them. We didn't make it very far as it was just minutes before they started begging to ride some rides. From bulldozers to monster trucks to the classic potato sack ride, any reservations that I had prior to attending the park were immediately put to rest. The boys had a blast. Dutch Wonderland, truly is, a Kingdom for Kids. Once they had their fill of rides, we continued on our quest to meet up with out friends at the water play area. Even though I was sidelined with our two month old for much of the time, this was hands down my favorite part of the park. With varying degrees of water spray based on your child's comfort, there was splash pad-type fun for everyone. The boys loved chasing each other around the water park, sliding down the tube slides and standing beneath the drenching buckets, waiting for water to rain down on them. After an hour of water fun, it was time to towel off and track down some lunch. Dutch Wonderland has numerous eateries including two open-air dining areas as well as the air conditioned Mill Stream Eatery and Merlin's Restaurant. It was clear, by show of sweaty heads and rosy cheeks, that air conditioning it was. Fifty-eight dollars later, (for Cafeteria-style food for four), our bellies were full and it was off to ride some more rides and see more attractions. 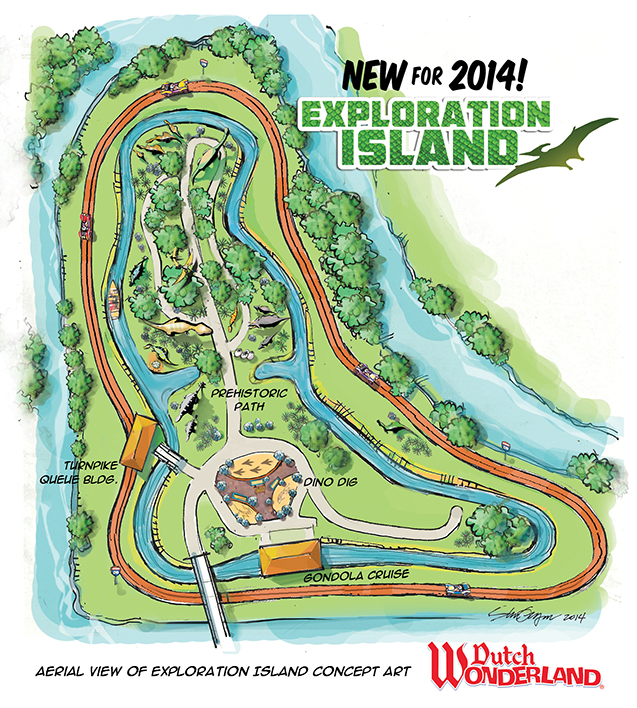 Brand new in 2014 is the park's attraction, Exploration Island. It was here that the boys dug for dinos, rode a Gondola and wandered down a Prehistoric Path complete with animatronic dinosaurs. Needless to say, it was an absolute blast. We wound down our day with a stop at the Dole Whip ice cream stand and enjoyed a refreshing treat before boarding the very popular Wonderland Special choo-choo train. After a spin around the park, we waved goodbye to all of our favorite rides and promised them that we'd be back again some day soon. It's been a little over one week since our visit to Dutch Wonderland and the boys still talk about their favorite rides and how much fun they had, especially on the Road Rally monster truck ride and the family-oriented Turtle (Tilt-A) Whirl. I think my stomach is still spinning from that last one! My final thoughts on the park if you're considering a visit are as follows: it is a pre-schooler's dream. The park is most definitely designed to entertain kids ages 2 to 6 and I guarantee they will have more fun than you could ever imagine. Be prepared, however, to spend a pretty penny. Entrance to the park is not cheap, rivaled only by the price of food. Not to mention that games, toy and snack stands abound and you cannot exit the park without wandering through the gift shop. Last but not least, this was, hands down, the CLEANEST, FRIENDLIEST amusement park I have ever visited. Guest Services were out walking the park grounds and extremely helpful when it came to locating the nearest restroom, snack stand, etc. And for a park that caters predominantly to children, it was cleaner than clean. It was absolutely worth the hour and forty-five minute trip from our home in Maryland and we will undoubtedly visit again. Thank you, Dutch Wonderland, for hosting our family for a day of fun! Be sure to check out Dutch Wonderland for events, trip discounts and more! I'm glad you had fun! I would love to take my kids there someday! My bestie lives in Annapolis. I'm going to have to tell her about this!